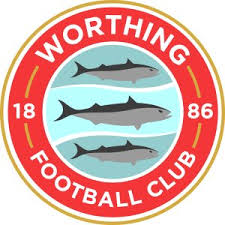 "Few would have tipped Whitehawk to have been capable of avoiding relegation heading into the season but Whitehawk confounded every expectation by achieving a solid mid-table finish." After a strong start to the season I was hopeful of pushing for a playoff position but it wasn't to be as we struggled for consistent form. Considering our preseason odds I'm content with the performance. An injury to our overall best player, striker Jason Williams, saw us lose him for 6 weeks and we struggled up front without his presence. Connor Tighe topped the leader board for most assists this season, being ever present on the left wing. Unfortunately he wants to move onto a bigger club and being on a month to month contract we may struggle to keep him around. A dismal season in cup competitions was regrettable. Rotating the squad too much proved to be costly. With a preseason focused on boosting the coffers, while possible detrimental to the season, allowed us to maintain a strong cash balance. While being declared a 'golden generation', the youth intake this season was lamentable. The only promising recruit is Dwayne Brewster. The goals for next season will be to push for a play off position and a much stronger performance in the cup competitions. I would like to maintain a good cash balance and push for professional status once we make the Vanarama National, but I'm struggling even to be allowed to improve my coaching qualifications at the moment. The board here, as shown by grungeandgaze, prove to be challenging to work with. Anyone has a kingstonian save with the most recent updates? Edit Got one. I stated before but lost interest am back again! "Few will have tipped Scarborough to have been capable of avoiding relegation heading into the season but the Seadogs confounding every expectation by achieving a top half finish. 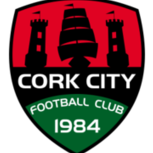 The Seadogs were one of the competition's surprise packages, consistently defying expectation and, owing largely to an impressive spell of form in September that saw them rise to 6th, were able to celebrate a successful campaign"
My sole expectation going into the season was to avoid relegation. Instead, a great season saw us finished sixth in the table and, had it not been for a poor spell in January and February, the season could have been the stuff of dreams. 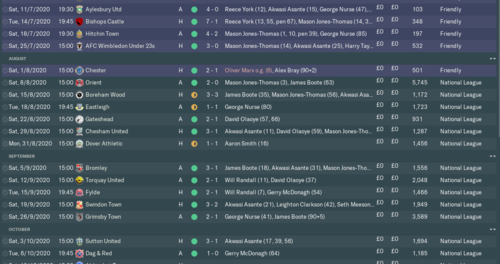 In the cup competitions, however, we were disappointing; we were knocked out of the FA Cup in the Third Qualifying Round by Altrincham, who beat us 3-2, while a very frustrating 1-0 defeat away to Oxford City saw us knocked out of the FA Trophy at the first hurdle. Our best moment of the season was our 5-1 win away to Leamington Spa, who were in 2nd place at the time. Our lowest moment(s) was losing 4-0 both home and away to AFC Telford. When I first took over Scarborough, I didn't know what to expect in terms of squad, so I prepared myself for the worst. In terms of squad depth, there was very little there (hence my many transfers throughout the season), particularly in the full back positions, which has been a source of many conceded goals all season. However, I did get a very welcome surprise when I saw Michael Coulson and former Hull City player Will Annan in the squad, so unsurprisingly, my tactic was built around those two; Coulson finished as my top scorer with 30 goals overall, while Annan finished with 16 assists in all competitions. Their average ratings for the season were 7.14 and 7.08, respectively. Another player who I would like to highlight is Harry Hammett. 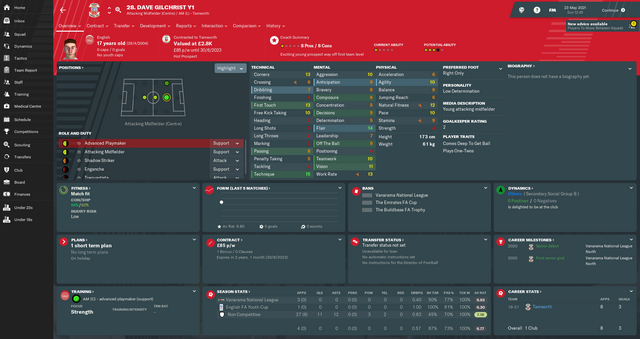 When I first signed him, I didn't expect much from him, but because he had an okay CA and good PA, I decided I would start him up top along with Coulson in a Target Man-Poacher combination (they swapped between roles - my primary reasoning for using Hammett as a Target Man was his height), and he rewarded my faith with 20 league goals. He did drop off rather worryingly in form from January on (I don't think he scored a goal since then) but to be fair to him, the entire team was performing poorly, and as a young striker playing first team football for the first time, I couldn't be too annoyed. He did end up winning the Fans' Player of the Season, Signing of the Season and Young player of the Season, so overall, it was a great season from him. An honourable mention should go to Wayne Brooksby, who finished with 12 assists and an average rating of 6.95, despite being played slightly out of position as an Inverted Winger on the left wing (he is a right midfielder primarily, but that position belonged to Annan). 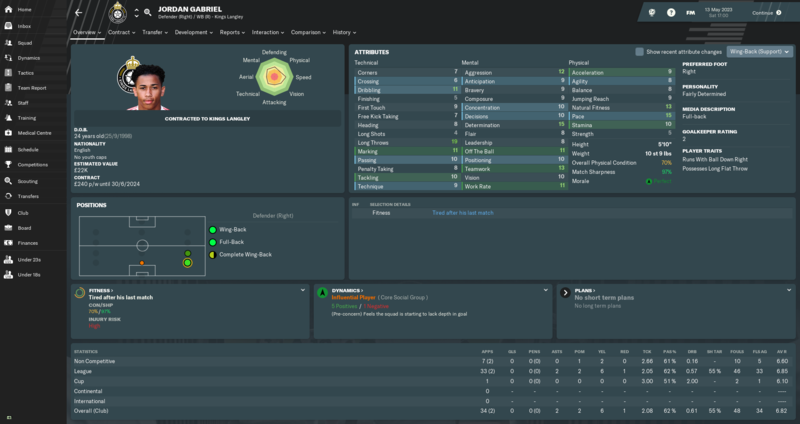 Due to the large number of players I signed, I won't speak too much about my transfers for now, other than saying, Hammett was the only player with a noticeable impact this season. 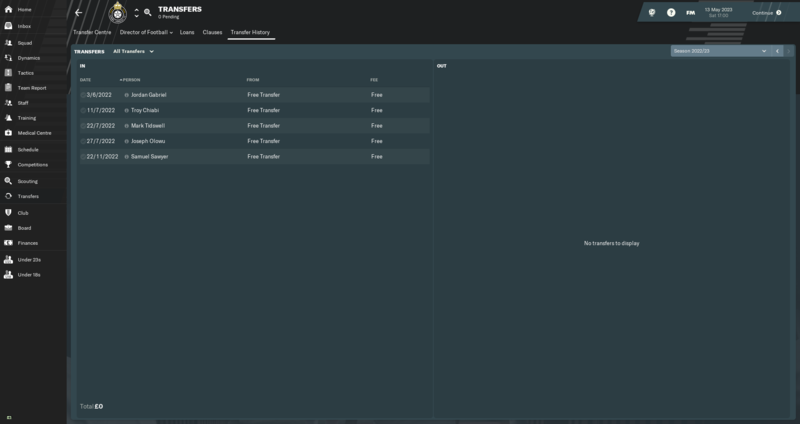 Players I signed over the course of the season who I hope will have a big impact: Mitchell Glover, George Hughes, Jozef Pastorek and Harevy Saunders. Sort out the full back issue, particularly left back. 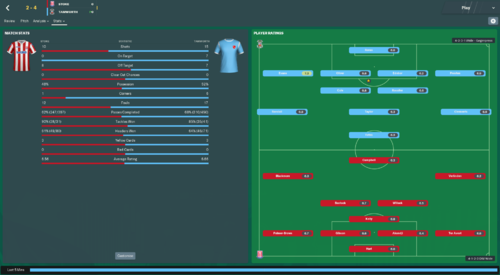 Try and become more defensively solid - we leaked a worrying amount of goals in quite a few matches, which led to situations where I drew a match 3-3 having been 3-1 up two occasions, various defeats by 2-3 goals, and almost letting 3-0 leads slip. Add some quality depth to the squad - the majority of the players I signed either played a handful of matches or didn't play at all, so some quality and versatile players to have on the bench would be welcome. Go on a deeper run in the cups - I'd like to get to the First Round of the FA Cup next season. 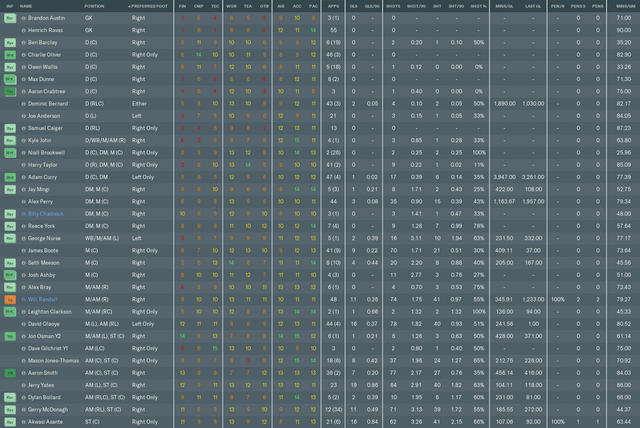 For those not yet started Heres the lower league database. No other database or updates are not allowed as per the challenge rules, only SI data update is permissible. I'll use one on the front page. 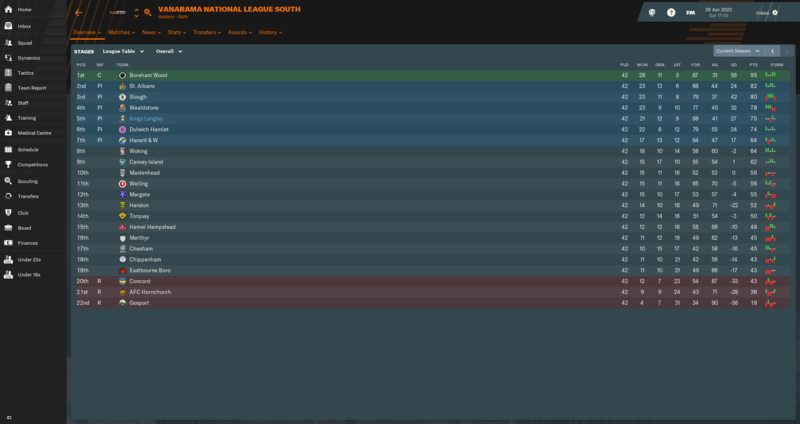 My first season with South Shields is over and we exceeded expectations finishing up in 4th place. The season began in a non-consistant way, one win was followed by a loss seing us sitting just below the play-off zone, but with some decent signings and tactical tweaks, we ended up ending the season on a 10 match winning streak. The first play-off saw us dismiss Chester 6-1 before we went out in a 3-2 thriller away to Stockport. 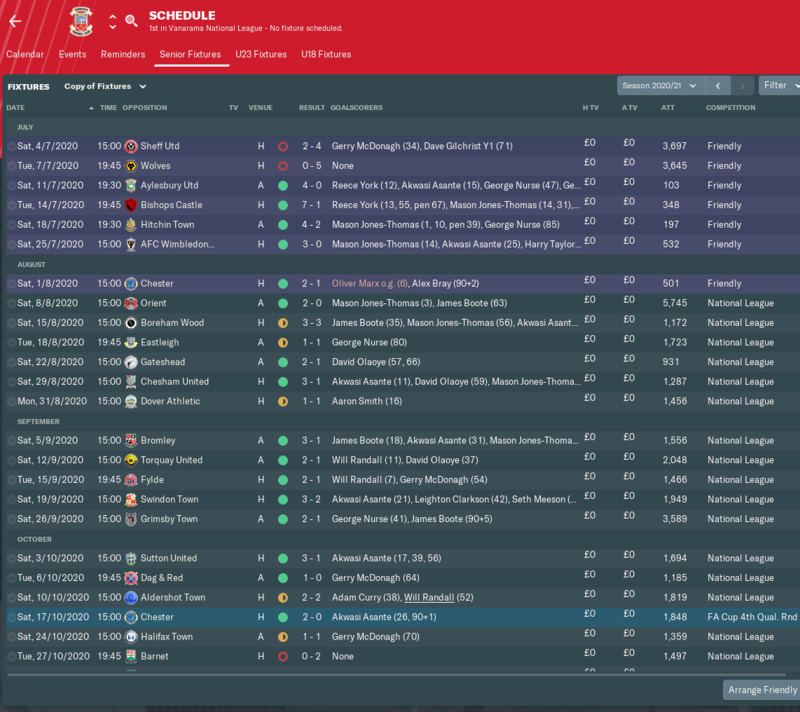 Promotion wasn't for this season, but with the squad we have, plus some additions that came in as the season closed, we should be able to mount a strong challenge next season (although we are predicted to finish 11th, so I've given the players the goal to finish mid-table, which is also what the board want). 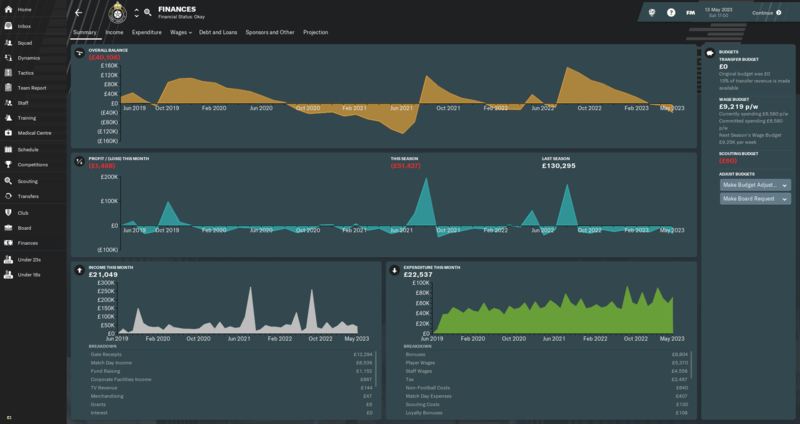 In terms of finances, the preseason allowed us to bolster the balance to just over half a million and we ended the season having made a solid profit of nearly 200k. This has allowed me to provide extra training for the coaching staff and I got my first badge. The board agreed to improve the youth facilities, so a large chunk of money was thrown into that. As the season came to a close, the chairman put the club up for sale. This made me very happy that I had finalised most my transfers before as we had a lengthy embargo while things were sorted. 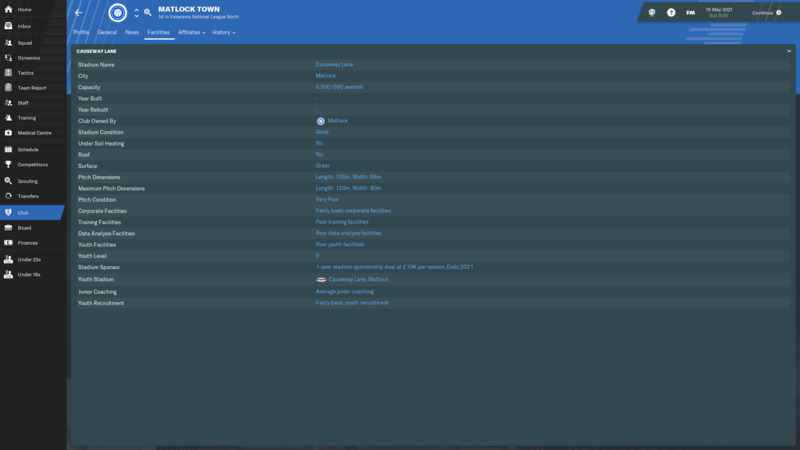 The new chairman has injected 40k into the club and given me a 50k transfer budget, which I will likely leave unused. The squad was solid across the board by the end of the campaign. The struggle when I arrived at South Shields was that many average players were tied to long term contracts. We did manage to shift some of these on during the season and others retired or ran down their contracts. We also had to sort out our attack as our first choice striker Charlie Jolley was not finding the net, regardless of his role and duties. He was replaced with Jake Beesley who arrived in February and kicked started our great run of form, netting 9 goals in 13 games. 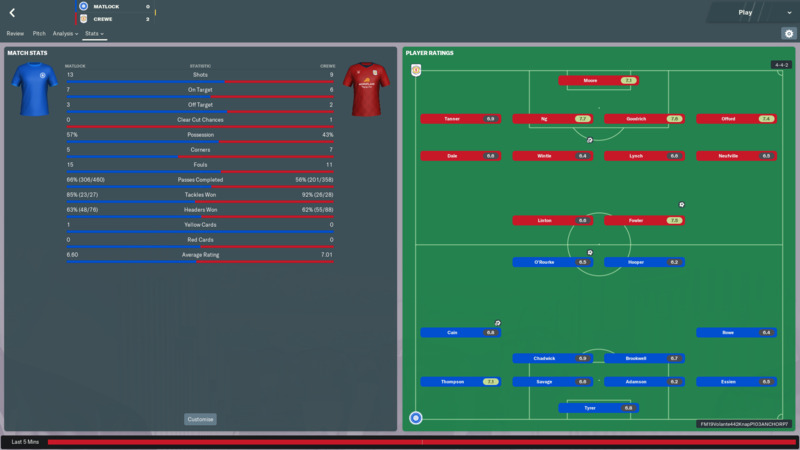 Tactically, we began with a 4-1-4-1 tactic with two wide players (one winger on the right and an inside forward on the left allowing support for our striker), but eventually switched to a 4-5-1 (attacking playmaker, ball winning midfielder, mezzala) as we had no natural defensive midfielder. Nice start. I would say the challenge financially will truly begin when they start expanding the ground, as it's needed to meet league regulations, but not needed in terms of support. It's weird how with South Shields I'm getting the same attendance in National League North that I got with Whitehawk in League One, especially considering the size of Brighton, you'd expect there to be a steady growing number. Nice start. I would say the challenge financially will truly begin when they start expanding the ground, as it's needed to meet league regulations, but not needed in terms of support. Yeah, that's ideal I think. 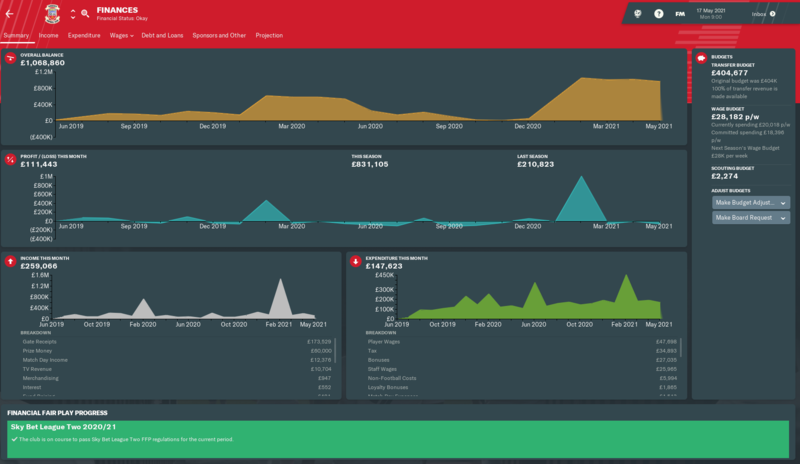 Whitehawk cannot really afford to lose 500/600k in a stadium expansion. For the second expansion, the funds were injected, but that first one came straight out of the balance. That's a shame, unfortunately there's nothing I can do about that apart from hope that people haven't used it. Looks like I overestimated the league and underestimated my team! Also because I underestimated my team I ended up getting in more players and now have a bloated squad! Yes. 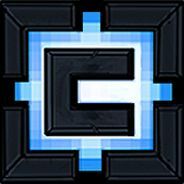 I am reloading again in hope of getting a good team. Thanks. Possibly is it due to Brighton already having a PL level team and South Shields does not? I just had a look and for a city with a population of 50k - 100k there is no other team in South Shields. Guess that means when the supporters want to get to a game that's their only option. Something I didn't think about, I only considered total city population, possibly an oversight! It's possible, South Shields are kind of part of greater Newcastle though, and have Gateshead to contend with. From what I read (if I understood properly), the team became Gateshead in the past, and a new team was formed. Personally, I think the Whitehawk reputation may be misleading. I read up about them, they have been in the media quite a bit over the past few years as their supporters are anti-rascism, pro-LGBT... and the club do a lot of work in those areas, which makes them interesting. On another note, Brighton and Hove Albion are not technically based in Brighton, but in Falmer, meaning Whitehawk are maybe the only real Brighton based club. Brighton (the club) are further from Brighton than South Shields are from Newcastle. But looking in-game Brighton are said to be based in Brighton, so that database error could explain it. So whereas South Shields are down as based in South Shields, part of the Newcastle urban area. Brighton, who are based in Falmer, part of the Lewes urban area, are put down as Brighton. Not sure how this affects things in-game. IRL last year South shields averaged 1400 and Whitehawk 270, Whitehawk were 2 divisions above South shields in the pyramid in the VNS. I don't think area always has a lot too with attendance in game, it depends on the average attendance set in the database as a starting point. 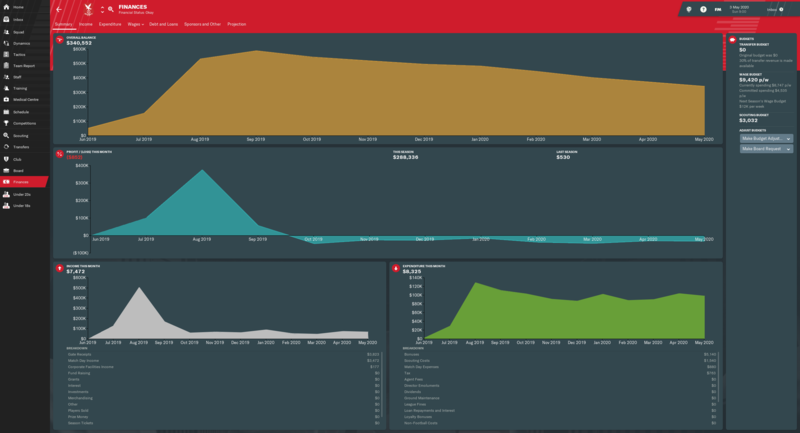 Attendances never seem to rise very rapidly in game even with promotions. Whitehawk also had a lot of promotions in a row and generally teams like that haven't built up a fanbase, there are a lot of teams in non league lower divisions with much bigger crowds. 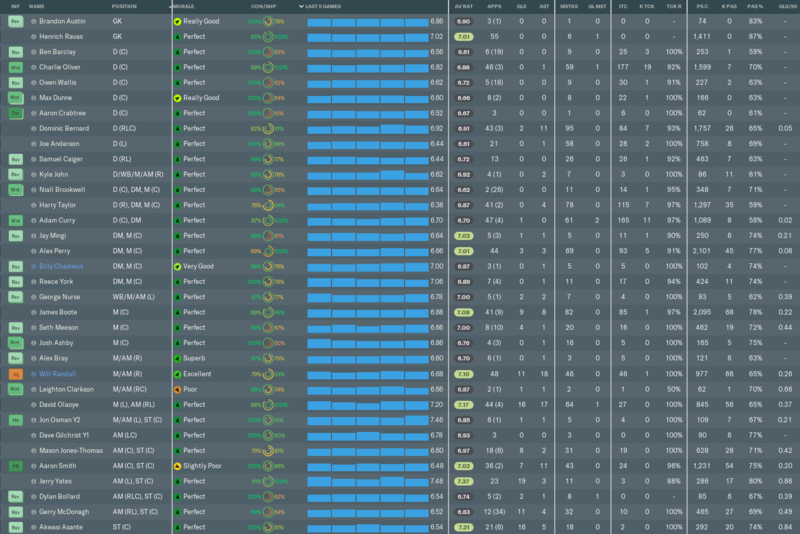 I think city population size mainly has an impact on max attendances you're able to get. I just check the starting attendances for all the 7th tier teams and South Shields do have the highest, much higher than all the other teams. 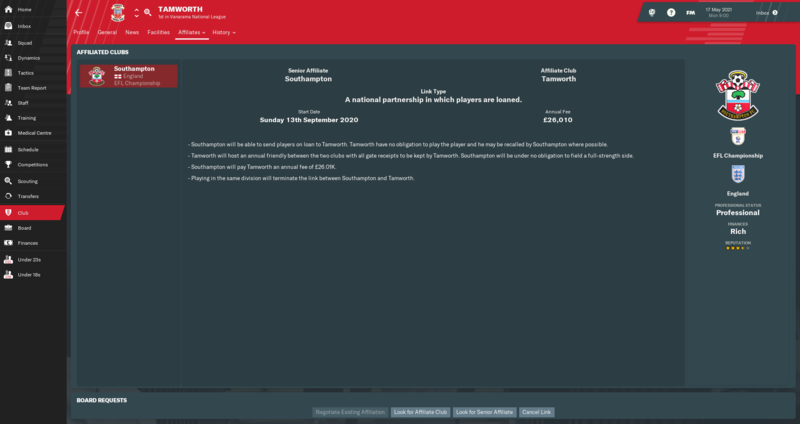 Restarted this challenge (with latest update) with Merthyr town in the mighty Wales ! Invited many free players Before 1/7 with last club based in 'north/south' or wales premier league or 'national league'. 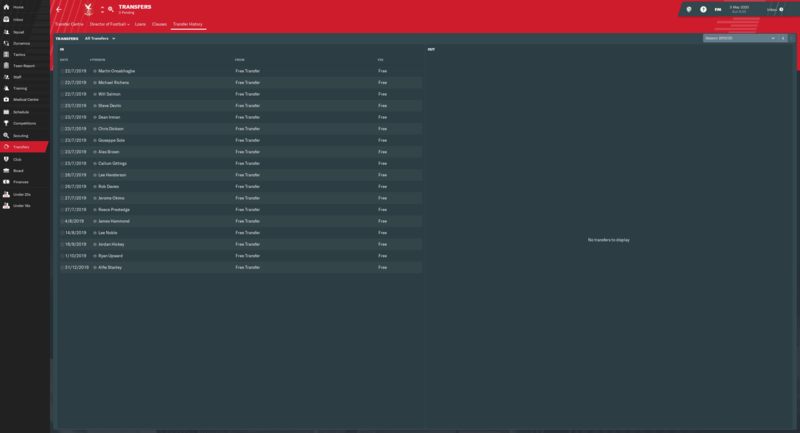 Found 5/6 good players and promoted them from u23(trialist squad) to first team; After 1/7 i invited all the released players from premier league till North/South . My biggest issue is : I have Lee Lucas, a great player with value +- 220k . He'll be the star player in this division but he receives almost 1/4th from my wage budget.. 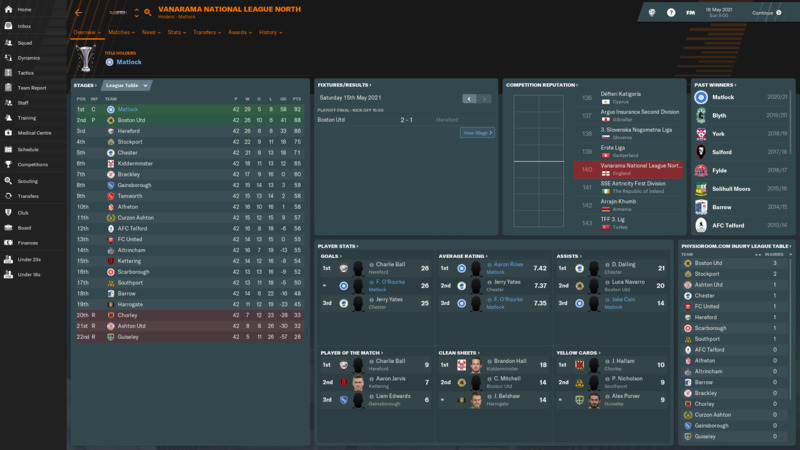 It went all the way to the last game of the season where we beat Boston Utd 4-0 to win the league. 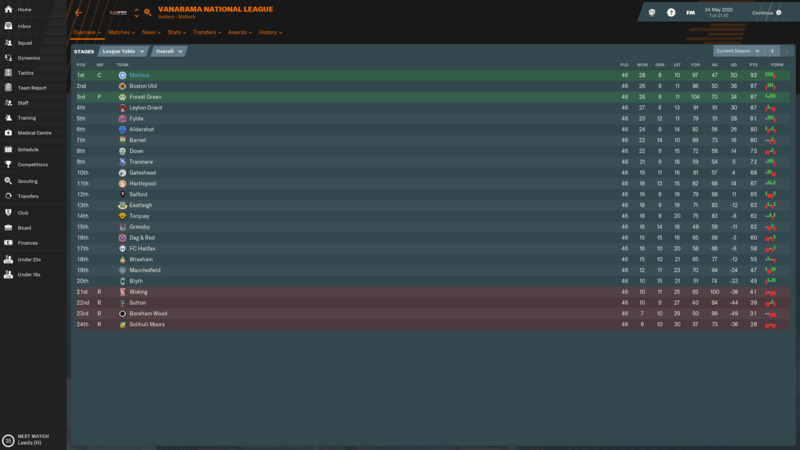 In the FA Cup we got to the 2nd round beating Stockport and Burton along the way. Crewe put us out even though we had the upper hand. Facilities haven't changed much, but i keep on pestering for a larger backroom and better facilities. 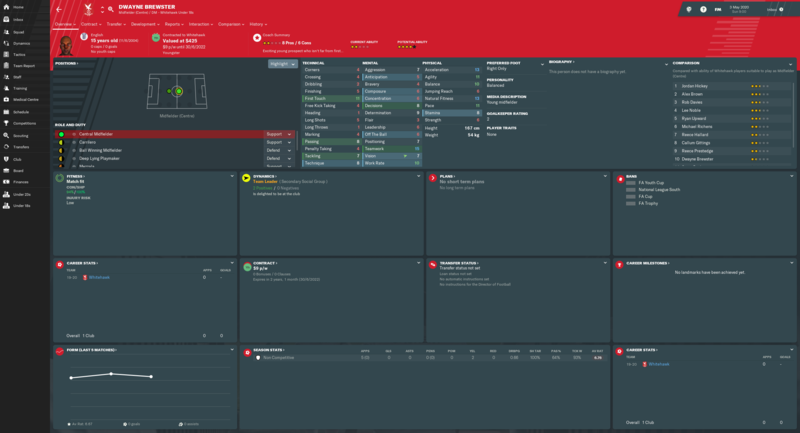 I've let my y1 promising player go on trial to a few clubs as i don't think he'll make it with me but he's still here slowly improving. Some Standout players for me. Niall Brookwell, Aaron Rowe, Jake Cain, Ryan Alebiousu, Cameron Thompson and Fidel O'Rourke. Who say's you can't win anything with kids. 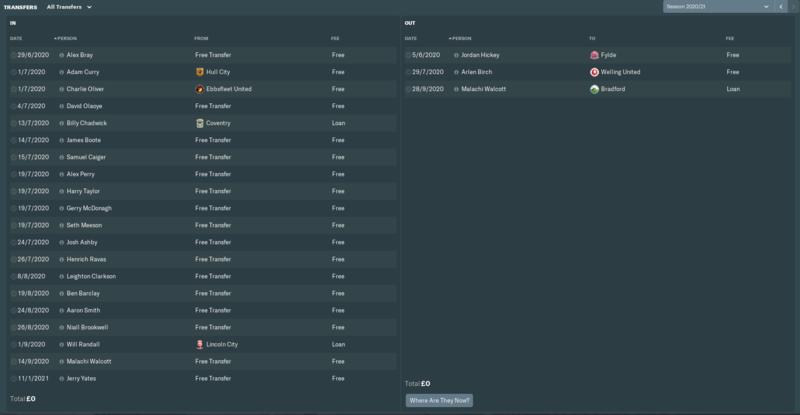 I went a bit overboard with signings but i've got the main guys on for another season so hopefully i can clear up shop and get in another batch of dumped premier league starlets. we have a very good result in friendly but then we lose 2 of our best player when i arrive at the club because we cannot afford the wage demand of them and I never manage to find a replacement as good as them. One of them depart just 2 day before the season kick off. We kind of struggle early on into the season with just 4 points out of 11 games. Then things start to be better we get 5 win 1 draw and 1 lose from the next 7 games. I mostly use 4-4-2 flat since pre-season till the end with slight adaptation on detail through out the season. I also try some 4-2-3-1 ,4-4-1-1 and 4-4-2 diamond but none of them work. The problem for the team is the defense we lose 107 goal which is new record for goal concede most of them were through corner ,indirect free kick and cross even though my CB duo have 194 and 188 cm tall with 11 and 12 jumping respectively. My attack is good though top 6th in scoring and one of my forward have 26 goals while top goal scorer has 27. 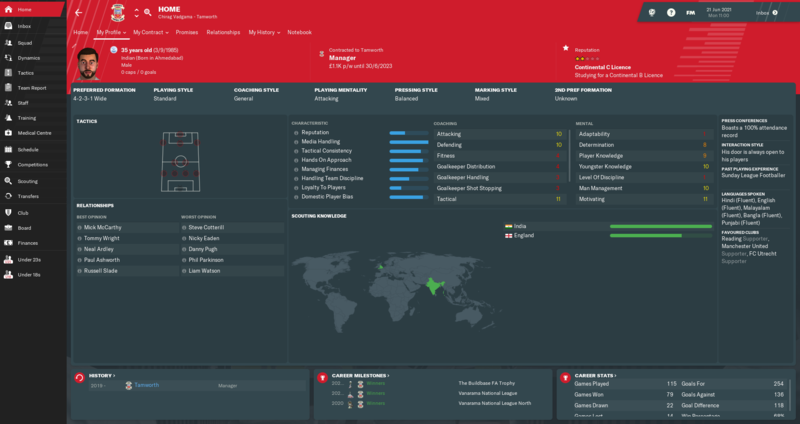 I will try DoF hope to get some good player from him and request senior team since board reject my request this season. Try to get some good defenders and hope we can finish mid table or even in play off spot. Update finished. Let me know if I missed anything. Also, it would be SUPER helpful if everyone would at least include in their end-of-season posts their team name, their division, the position they finished, the year, and, god willing, if they won the Champions League. Now, most of you get most of those, but there's a lot of posts in particular that don't include the division they're in. If all that information is there it takes me 10 seconds to update your entry on the spreadsheet, if it's not it can take a few minutes. If you just say "first season done, finished 13th with Suchandsuch Town" or something like that and don't even include a table, well, I'm an American so I probably have no idea where Suchandsuch Town is, so I gotta go look at a map and make an educated guess as to whether you're in the North or South. Less annoyingly, having to open images to find the information takes time too. I mean, I'll do it, would just prefer if y'all made it a bit more straightforward. 2020-2021 What a season! 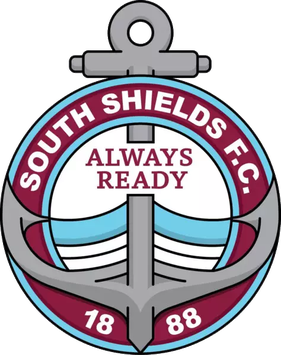 South Shields finished firmly top of the league, breaking several records along the way, and grabbed themselves an FA Trophy in front of 19,000 fans at Wembley. Finishing well above expectations, South Shields ran away with the title. The team finished with a record amount of goals scored and the best attack in the league, this was coupled with the best defence. They beat the league's record for points and wins. After a disappointing elimination in the FA Cup, South Shields mended this with a great FA Trophy run beating Solihull in a 3-2 thriller at Wembley. Highlights in the season included an 8-1 thrashing of mid-table Southport and a 5-0 thrashing of play-off qualifiers Kidderminster on the final day of the season. Financially, the club are in a good position. The FA Trophy win boosted the coffers and another windfall is expected for the league win. The board injected close to 700k for a stadium expansion, which will increase the capacity to 4,500, around a 1,000 increase. During preseason, we managed to recoup the funds invested into the youth facilities. I have asked the board to go professional, but they do not believe the finances are adequate enough, which may mean a struggle in the National League, or at least a 2/3 build up to promotion. Jake Beesley efficient in front of goal, the striker netted 32 times in 46 games, finishing as the league's top scorer on 27 goals, a new record. Josh Gillies, a player at the club when I arrived, was our inside forward. He won the player of season award thanks to his 18 goals and 18 assists in 42 games. He also grabbed 9 PotM awards over the season. Simeon Oure, a player who was released by Sheff Utd, was our main winger. He got 1 goal and 19 assists in 43 games. Both he and Gillies equalled the league's most assists with 15 each in the league. Unfortunately, Oure's contract cannot be renewed as the Frenchman was denied a work permit in the new Brexit rules. He will be a loss. 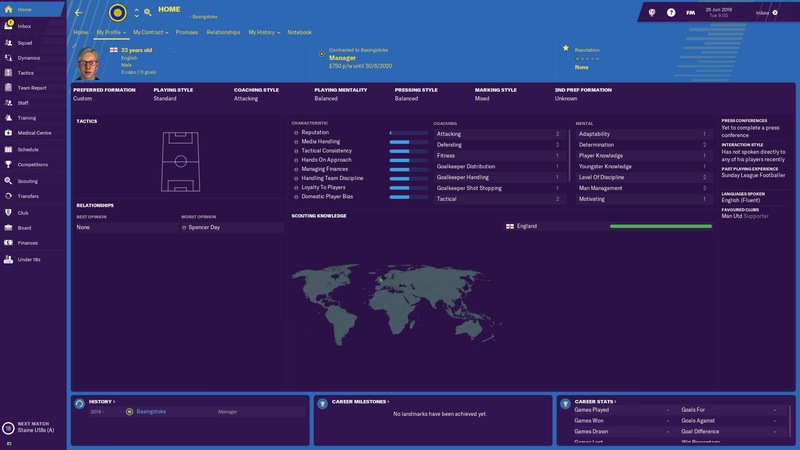 Daniel Wright, another player who was at the club when I took over, is our attacking playmaker. 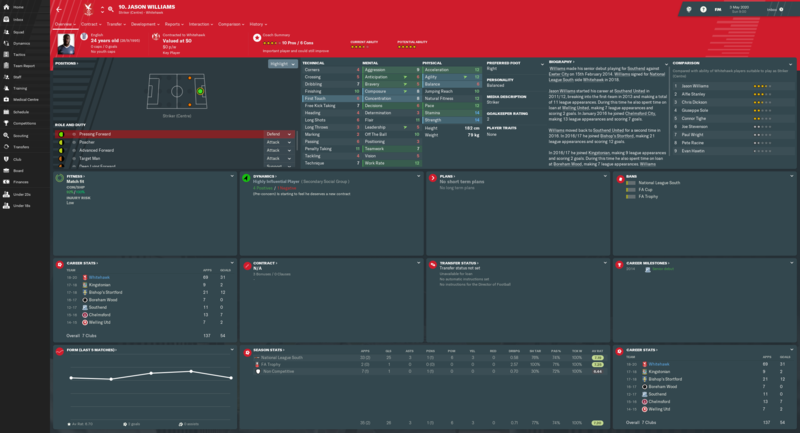 He got 8 goals and 10 assists, he also got the squad's best average rating with 7.36 over 43 games. Tyrone Duffus, came in after being released by Fylde. The defensive midfielder was a rock but also a creative force netting 11 goals and assisting 5 times over 49 games. Oliver Byrne was a solid presence in goal. 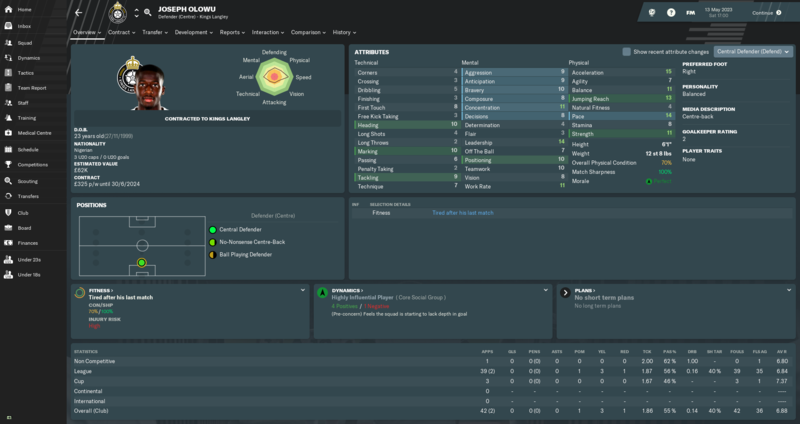 The ex-Man Utd academy keeper who we picked up on a free from Blackburn the previous season conceded 47 and kept 17 clean sheets in 53 games. Alex Kempster is also a player worth mentioning, despite only being a back-up to Gillies. 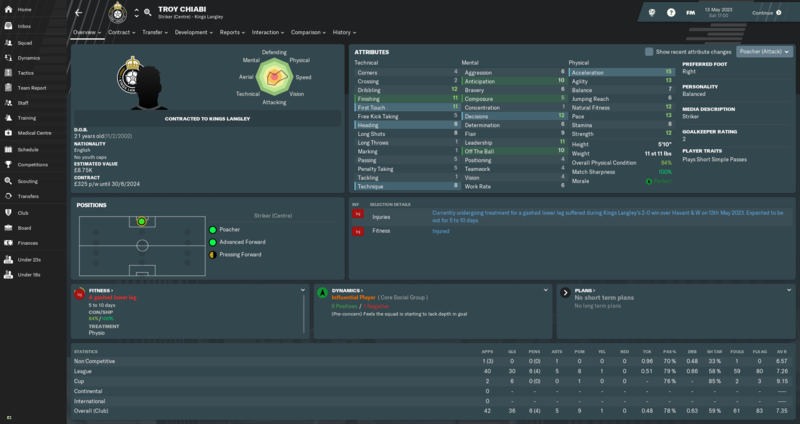 We picked him up on a free after he was released by York City. He scored 12 and made 4 assists in 29 appearances (11 from the bench). There's a strong chance he may become the first choice inside forward next season as he has more potential than Gillies. Tactically, the team started with a balanced mentality but shifted to a positive over the season. Duffus being a natural defensive midfielder allowed us to go back to a 4-1-4-1 which proved more efficient defensively, whilst allowing the attacking minded players to bomb forward. I have already signed a couple of players to strengthen for the upcoming season in the National League. 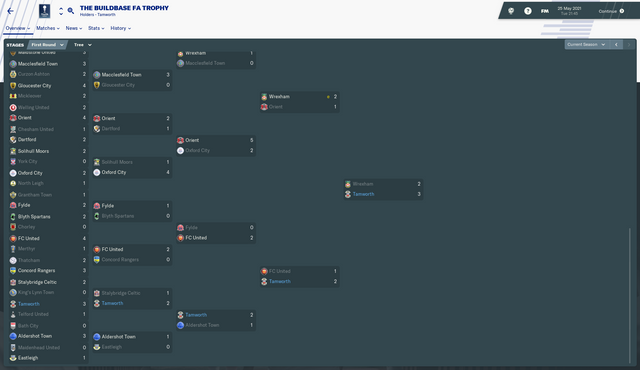 I am currently preparing for my next badge and have just won the manager of the season award. 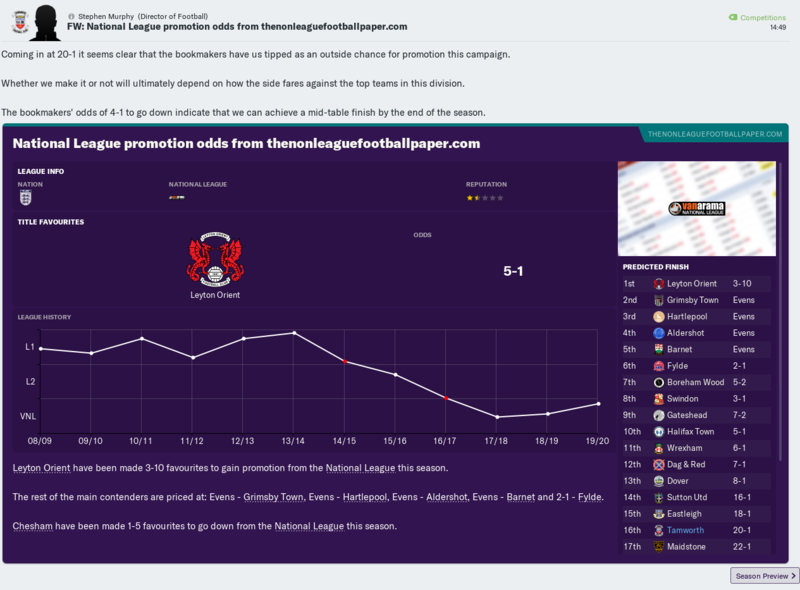 @grungeandgaze Mate you might want to mention the league you are in or at least leave that in the screenshots, took me to two readings to figure out you won promotion to National League. Good luck on your next season. Sure, I thought I had. Thanks, I'm looking forward to it. Anyone finding it a load more difficult since the last update, or is it just coincidence that I was top of the league and playing well prior to it and now apparently cannot win a game since? Do you find yourself tinkering with tactics much for different opposition and/or during games? 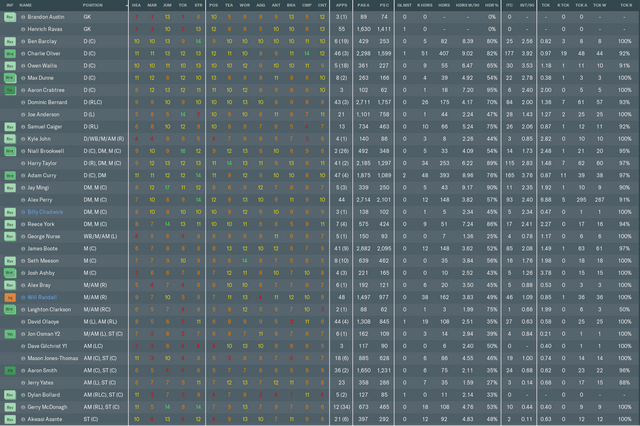 I'd call myself an average FM player, but really stuggling for form this season. Think I've been sitting back a little too much though with the new line of engagement option, now I have a much more committed and hard working squad I'm going to experiment with a higher press. Not at all, I tend to tinker during the season. If I see results begin to drop, I look at changing things around. I believe that if you go on a good run, teams change their approach so it's important to adapt. But I keep it as close to the original set-up as possible. I have began the new season well, but that soon dropped with some dreadful results, so I'm currently looking to balance it up again. During the matches, I just use a lot of shouts to keep the players on their toes. Did not know my coaches could do comedy! 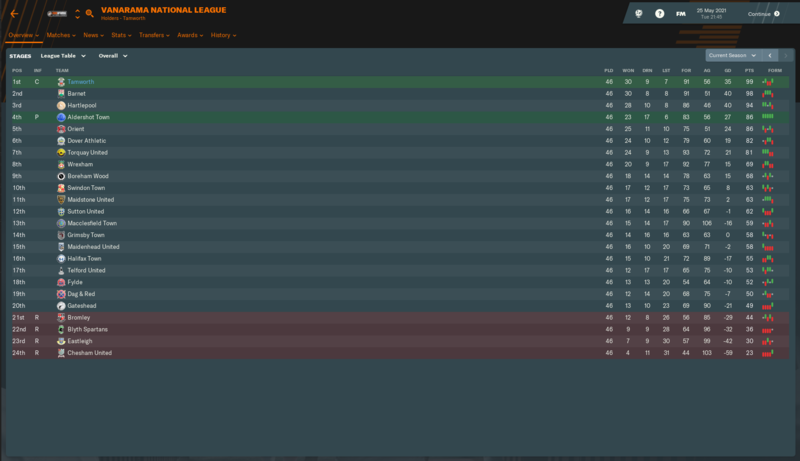 Well another season is over, we were predicted to finish 19th and after a great start to the season which saw us flirting with the play-off places, we started to fade. The tactics from the previous season no longer worked and we stopped scoring whilst conceding enormous amounts. This led to lots of tweaking as I tried to patch things up and the club's worst ever run of games with 11 league games without a win. We found ourselves all the way down in 18th spot. But with a new tactical set-up we picked up a surprising win that led to the club's best ever run of 13 games unbeaten which saw us finish up in 7th and a play-off spot. Unfortunately our good run came to an end against our local rivals Gateshead in a 3-2 thriller. Gateshead went on to win the play-offs and joined York City in promotion. This bodes well for the upcoming season. We will look to strengthen certain key areas. We have already agreed a contract with 18 year old right winger Billy Dunn from Liverpool on a free. Other areas of interest will be the goalkeeper, right full back and attacking playmaker. Financially we are doing very well with 1.4M in the bank. Another strong preseason helped. The board are being difficult though, refusing to invest in the facilities and claiming we are not financially strong enough to go professional. 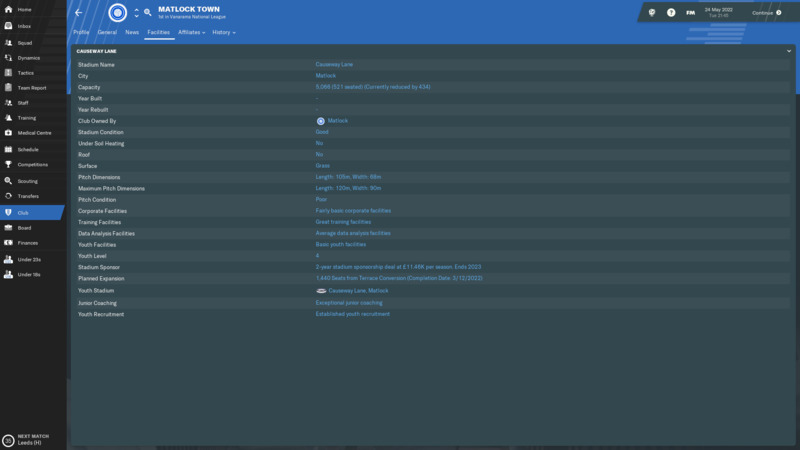 They have given me a ridiculous transfer budget of 650k, which I would much rather see invested elsewhere. Daniel Wright who played in the advance playmaker spot was our best player, he scored 14 in 34 and made 12 assists, picking up 9 PotM awards and an average rating of 7.42. He was voted National League player of the season. I finished third in the manager edition. The aim for next season has to be promotion, so fingers crossed. I have managed to convince the board that youth is the way to go and have now got exceptional jr coaching and established youth recruiting. My youth facility upgrade got canceled when we were promoted and they're adding 1440 seats to the stadium. I have great training facilities through Loughborourgh University too. 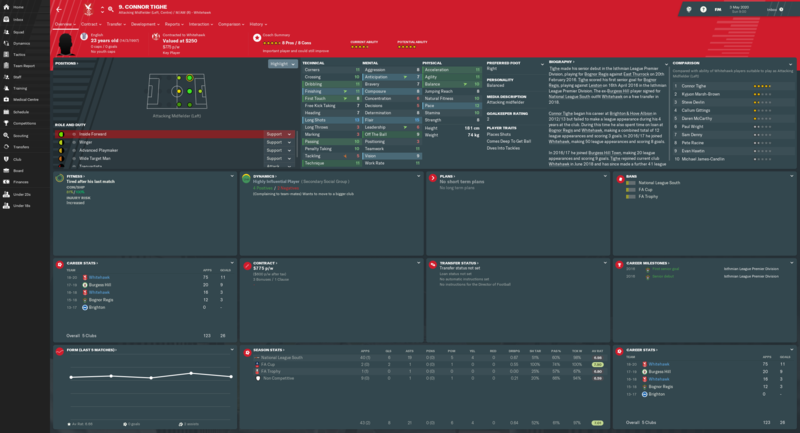 Only Niall Brookwell stayed in the team and looks to possibly continue in it in League 2. Here's an imgur folder with some of y3's youth recruits. y1 recruits have been let go and there was no one in y2 worth renaming. 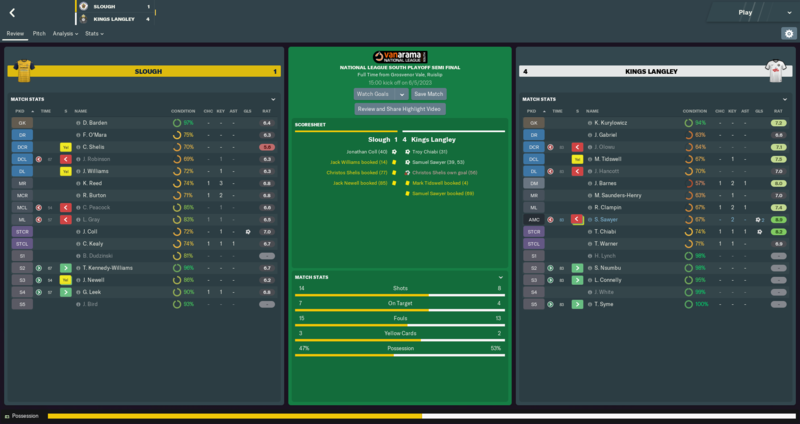 We were put out in the first game of the Fa Trophy which probably helped us in the League a bit, (3-0 loss at home to Hartlepool) but managed to beat Wycombe in the 1st round FA cup before being dumped out by Accrington in the 3rd. We are now 461k in debt and have a wage budget of 27k so it might be quite hard to stay up. 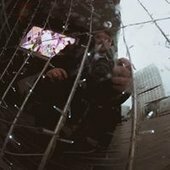 You can track me live on twitch but i tend not to be talking and have the sound off so it's not the most entertaining of streams. So my captain is now unhappy because I didn't fine a player who didn't show to training. The thing is though, that player is on a non-contract. Second time I've had this happen now in 2 seasons. Should make the rest of the season a little more challenging..
"It was a memorable season for Tamworth as they tasted success in the Vanarama National League and The Buildbase FA Trophy. 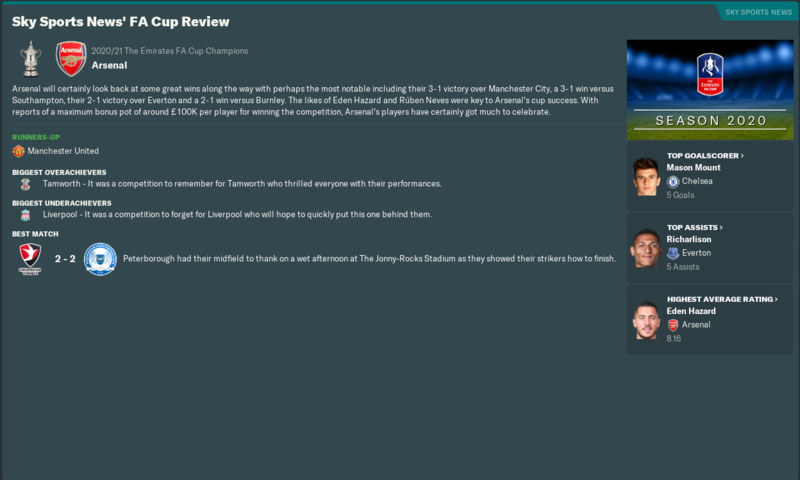 All of Tamworth's dreams came true this season as they defied expectations suggesting that they would be relegation certainties and instead mounted an almost unbelievable title-winning campaign. 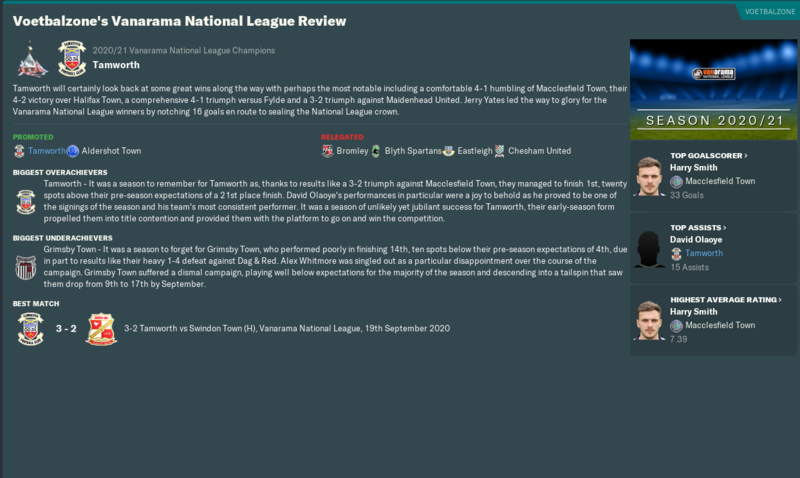 It was a season of unlikely yet jubilant success for Tamworth, their early season form propelled them into title contention and provided them with the platform to go on and win the competition." 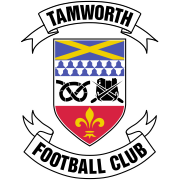 Tamworth F.C. do the Double! If I was offered mid-table finish at the start of the season I would have happily taken it, I was under no illusions of where my team stood in the league but turns out I underestimated my team as much as I overestimated the league. 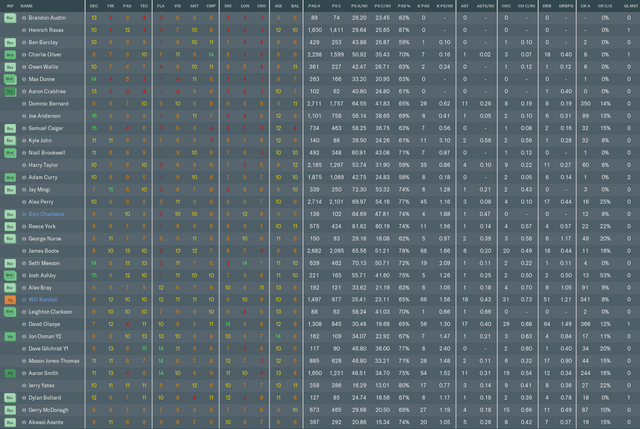 Pre-season odds had us pegged for a bottom of the table finish at 16th with an outside chance of promotion. 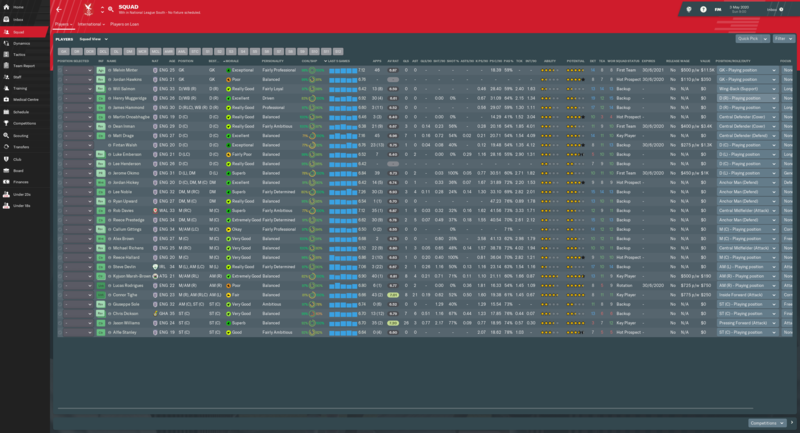 The first match of the league was against pre-season favourites Leyton Orient, we came away with a 2-0 win which immediately had me sit up and take notice of my team's potential to cause a disruption. The first three months of the season saw us draw 5 matches and lose only one match that too against fellow promotion chasers and favourites Barnet while winning 11 matches including winning run of 7 matches through September. By December 1st we had lost two more matches and won 3 before we went on a long run of 12 wins and 1 draw right into the last two months of the season. 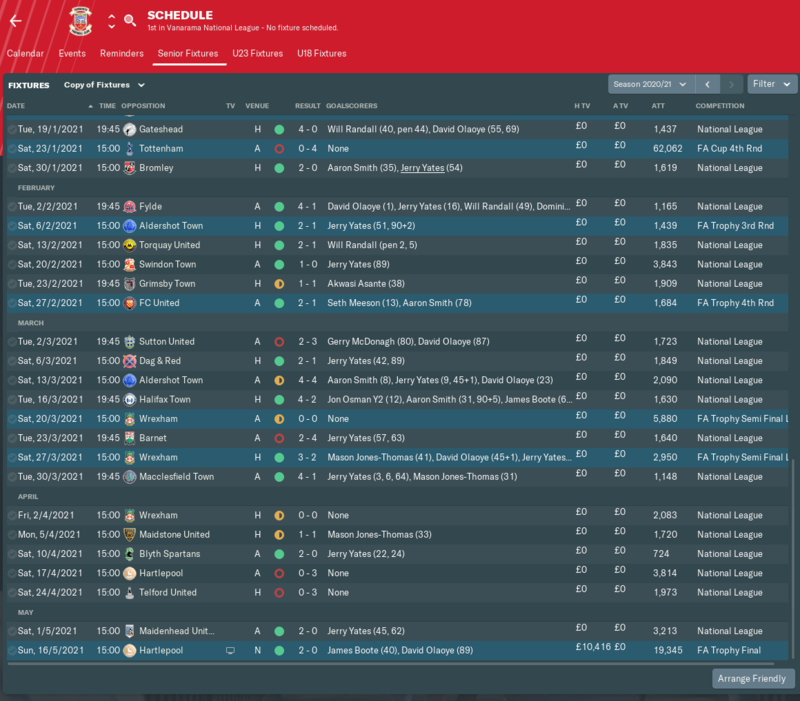 The last two months of the season was quite a roller coaster ride as my team would go from playing the opposition off the park to disappearing off the park themselves. Thankfully, the early season form helped us as we did not drop down the table though it did make the season end an exciting one as we allowed Barnet and Hartlepool United to close the gap. Barnet had already done the league double on us and we had to play Hartlepool United in the run in. 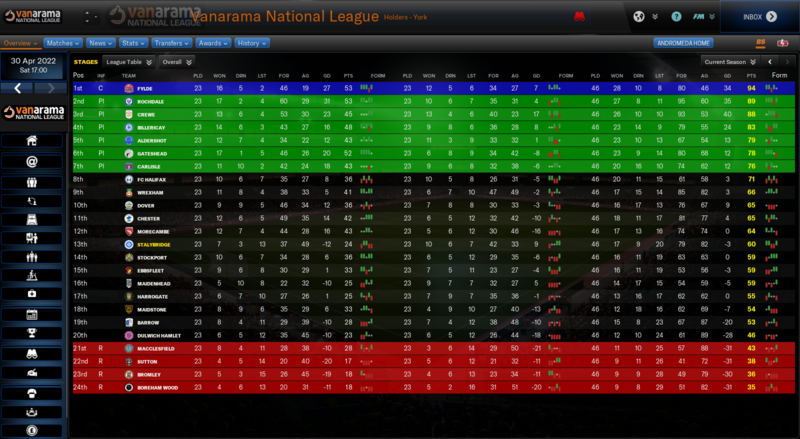 Going into the final few matches of the season we were in woeful form while Barnet was in ominous form. The match away at Hartlepool United was a virtual final because if won away we would be crowned champions but we completely choked as we lost the match 0-3 making them the second team to do the league double over us. Despite the wobbly form we still held the reins in our hands as a winning home against relegation battlers Telford United would be enough for us and considering we never lost against them in previous 4 matches it seemed like an easy match. We lost the match 0-3 against the only lower table team to beat us this season. Going into the last match of the season any of the three could have been crowned the winners provided other results played their way. For Barnet to win we had to lose and for Hartlepool United to be crowned champions the other two teams had to lose and they had to win for them to still have the possibility of being crowned champions on Goal difference. For Tamworth F.C. only a win would be helpful unless both Barnet also failed to win but that seemed an impossibility as they were home against Relegation candidates Bromley. Thankfully for me, the team did not make it a stressful last day as we played much better and eventually it was a case of breaching the castle which did not look doubtful as we ended 0-2 winners away from home which brought to close an exciting season to a jubilant end. We set a new Vanarama National League record as we ended the season with most points in history at 99 points. A good cup run is so very important for financial survival for a small team like ours the squad probably understands that because while we are doing great in the league the cup ties saw them bring an altogether another gear. After pushing aside National League North Team Chester with ease in the 4th qualifying round we faced three EFL League One teams in the next 3 rounds. 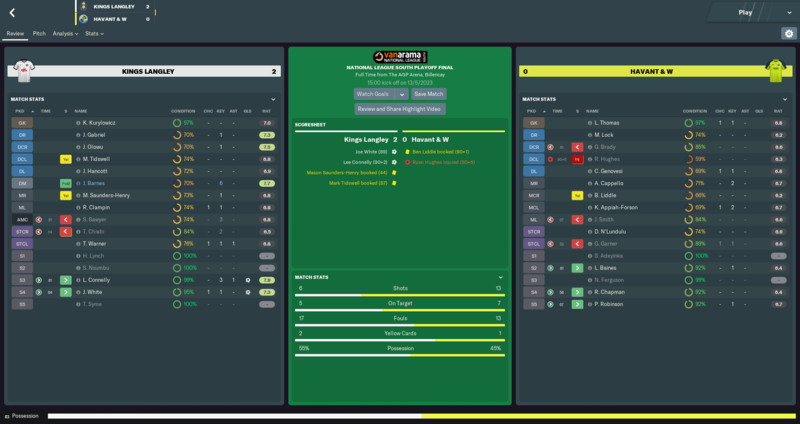 First up was a televised match at home against AFC Wimbledon we dominated the possession and while our defence was not the greatest their defence was even more shambolic so it was a question of who took the advantage of the situation, the match ended us as 2-1 winners. The next match away at MK Dons had us in the early lead through David Olaoye, however, we went into halftime at 1-1, the team came into the second half firing all cylinders and put their nose ahead again before being pegged back right from the restart. The game was heading towards a draw before a brilliant piece of run from David Olaoye saw Gerry McDonagh tap in the winning goal in injury time. The 3rd round match against Burton Albion away was a match of clinical finishing and determined defending as despite having only 36% possession the opposition was ineffectual in the final third, their only goal coming because of a missed interception of Adam Curry as we finished 1-3 winners thanks to brilliant performance of midfielder Alex Perry who grabbed a brace. The fourth round had us line up away against Tottenham Spurs, we expected to lose the game and we defied no expectations as we were played off the field by the eventual semi-finalists. Despite having almost equal possession we could not make any inroads and every time they won the possession back it was a question of will they miss or will they score. The only player to come back with his head held high was the goalkeeper Henrich Ravas without whom we could have ended up losing by double-digit, as he single-handedly denied them 12 times despite conceding 4 goals. 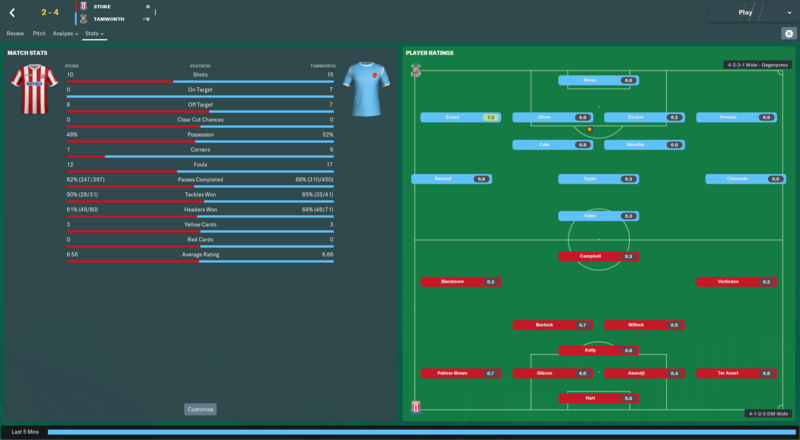 Though this was not a televised match the matchday income was a huge boost as we nearly got a million euros in the bank, helping us stay afloat and end the season in positive financially. 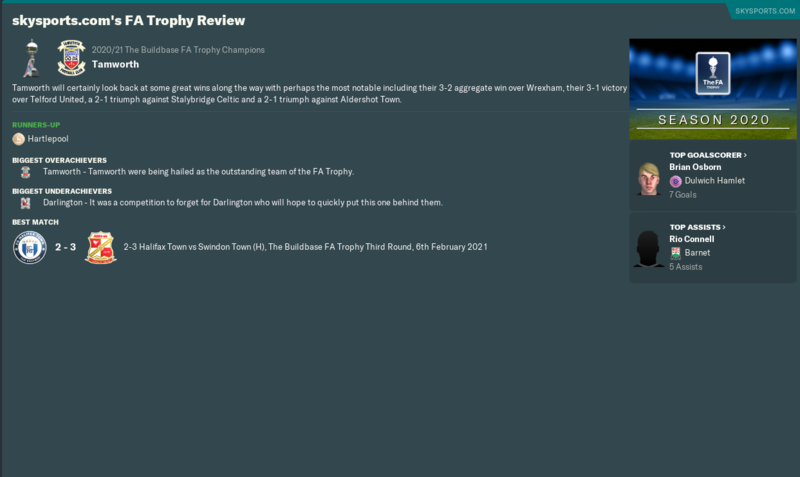 The FA Trophy run was pretty much a breeze as we won with easy against Telford United (3-1), Stalybridge Celtic (1-2), Aldershot Town (2-1), FC United (1-2) before we faced Wrexham in the Semi Final. The first leg away was a dreary affair as none of the team could break the impasse and I was disappointed we did not come away with an away goal. The second leg at home was an open-ended game as both teams tested each other with Wrexham getting the opening goal before two quick goals before half-time saw us head into the break at 2-1. 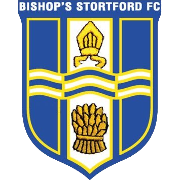 The restart was an end to end affair as both teams kept testing the goalkeepers with January signing Jerry Yates scored a poachers' goal to put us in a commanding position, however minutes later a stupid mistake by Charlie Oliver saw us concede a penalty. 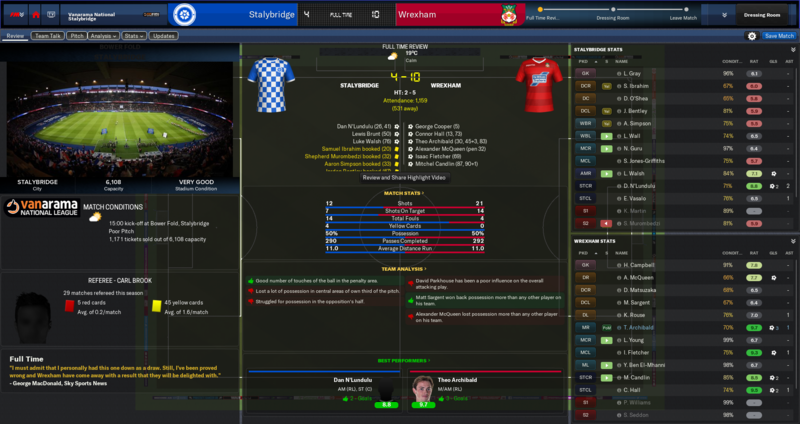 The last 25 minutes was the most nerve-racking moments I have had yet in this career as Wrexham threw the kitchen sink along with the kitchen at us while we defended for our dear lives eventually holding out for a 3-2 win. The final had us drawn against Hartlepool United one of the only two teams who successfully did the double on us in the league. 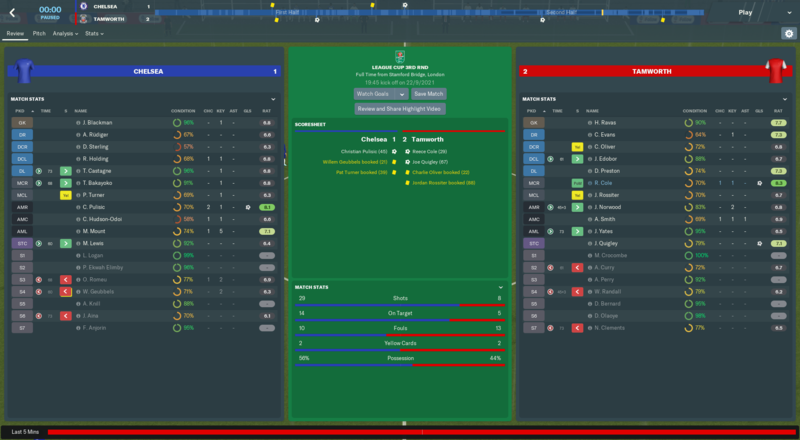 The defence put on a defending masterclass in the final as we shut out the opposition players, Hartlepool United never had possession that threatened us and could never break the defence to get into the box. One goal each in each half was enough for us to win the match 2-0 and be crowned the FA Trophy Champions. Of the last season squad, only 3 players made the step up and held their places in the first team with the rest all falling down the pecking order. Akwasi Asante started the season in the same form he ended it last season as he finished the season with 16 goals and would have scored many more had he not been dethroned by January signing Jerry Yates. Yates had a brilliant season as he scored 16 goals in 16 League matches and still finished the season in the top 20 goalscorers of the league with one goal coming every 87.50 minutes. 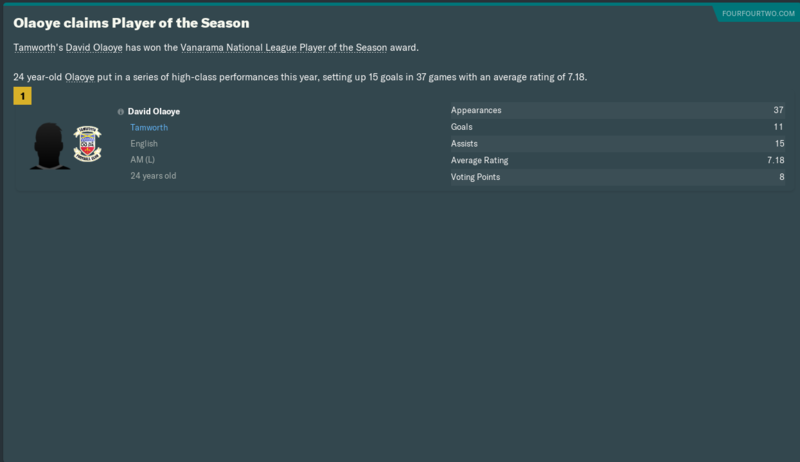 The wingers were a potent force as the toyed and tore apart most defences, David Olaoye racked up 16 goals and 17 assists on his way to claiming the National League Player of the year as well as Club end of the season player of the year award. Will Randall gave him equal competition as both tried to outplay each other every week, he ended the season with 11 goals and 18 assists as he set a club record most assists in a season beating the record set the previous season by 1 assist. The defensive duo of Charlie Oliver and Adam Curry formed a rock solid partnership at the back with both of them winning about 9 headers per 90 minutes while leading the charts in interceptions per 90 as well. Behind them was the towering presence of Henrich Ravas who ended the season with 15 clean sheets and ahead of them was wrecking ball in the form of Adam Perry who flourished in the midfield as a Ball Winning Midfielder, winning a staggering 267 tackles which was more than combined total of the next 5 players with most tackles won in the squad. Dominic Bernard was an important cog in the wheel for me and had an impressive season and it says a lot for the squad that despite such an impressive performance he did not figure in the Fans' player of the season award. Bernard ended the season with an impressive 11 assists from the back as well as nearly topping the charts for his passing stats. Last season club captain Aaron Crabtree found it tough to crack in the national league as he had a disappointing season, the ever-present defender of last season barely made 3 appearances all season. Similarly, it was a disappointing season for the player of the season from previous season Jay Mingi. Only Mason Jones-Thomas and Joe Anderson made a convincing step up to the higher league. Anderson constantly gave competition to Bernard making a credible 21 appearances in the season. Meanwhile last year long shot hero Jones-Thomas continued with his exploits as he finished the season with 8 goals and 2 assists in only 18(6) appearances. First-year graduate Dave Gilchrist found it difficult to step up to the National league as he featured only thrice doing well. Mentoring has been helpful in bringing a change in his personality as he lost his unambitious tag. 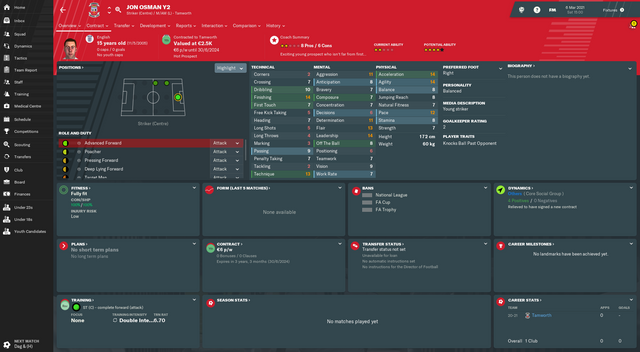 The second-year youth intake was rubbish except for one player, Jon Osman who looked impressive from the very first day and was immediately brought into the first team squad after signing. Days later he made his debut becoming the youngest player for the club as well as in the league. He started in his second match a week later to score his first goal for Tamworth against Halifax Town. He also became the youngest player in the FA Trophy when he started against Wrexham in the semi-final first leg 4 days later. Next season will see us compete in the League 2 and accordingly, we have gained Professional status as well as an expansion of a stadium by 1,750 seats. While the stadium expansion goes on we are moving to the 10,989 seater Banks' Stadium. With the new chairman settling in, he is not as willing to grant me requests so except for a few staff increases all my requests got denied. We did quite well in terms of injuries with only 20 injuries in the entire season with only 3 long injury layoffs. 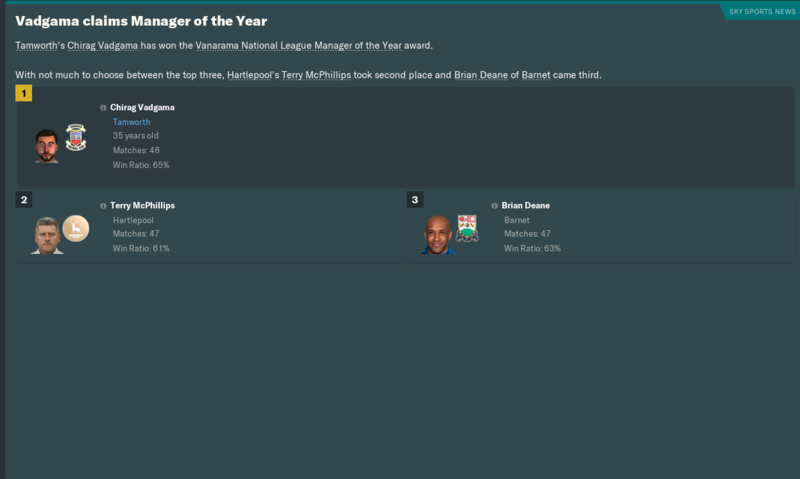 Also, yours truly ended up winning the Vanarama National League Manager of the Year. During the course of the season, I also breached the 100 games in management as I finished the season with Continental C licence. 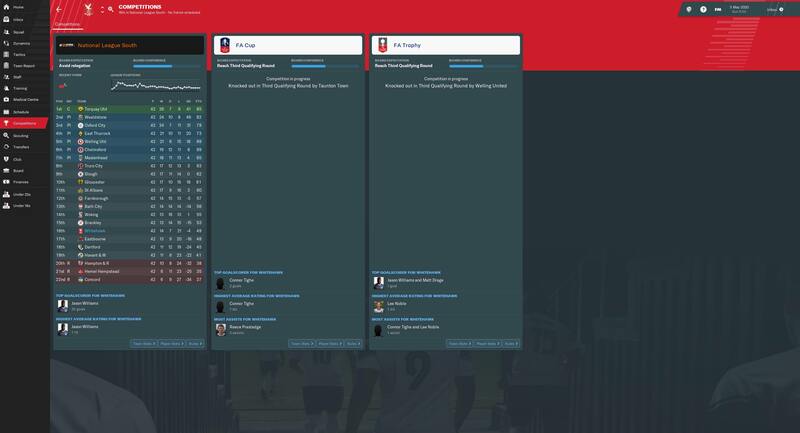 The 2021-22 season will see us compete in the EFL League Two, hopefully, we can avoid relegation. With a lot of the current squad on a two-year part-time contract which will need to be upgraded to full time, I don't see a massive overhaul of the squad possible this season. We would do well to bring in few quality players in who can stick around longer even when we win promotion. Over last two season, the squad has had a lack of sufficient Influential players and absolutely no team leaders and I hope I can get in players to fill those gaps. 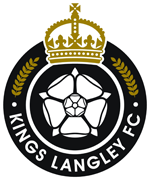 Manager favourite Reading FC started the season brilliantly to claim the top spot early on in the season before mid-season slump having an effect on their final standing. However, they recovered well in the second half of the season to finish 2nd and winning promotion. Tottenham Spurs, Real Madrid, Paris SG, Inter Milan, Bayern Munich, FC Porto, Ajax, KAA Gent won their respective leagues. Bayern Munich won the UEFA Champions League and Tottenham Spurs winning the UEFA Europa League. France became the European Champions 2020. India is ranked 104th in the world dropping from last year high of 96. 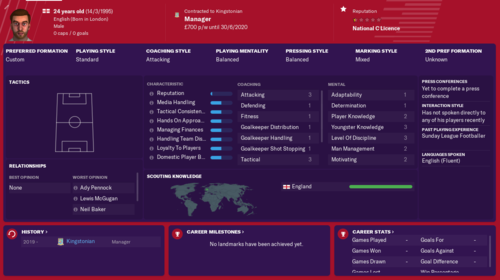 So, after not playing much single player for a few versions, I have had a fair few saves already on FM19, but I thought it was time to do the challenge once again. 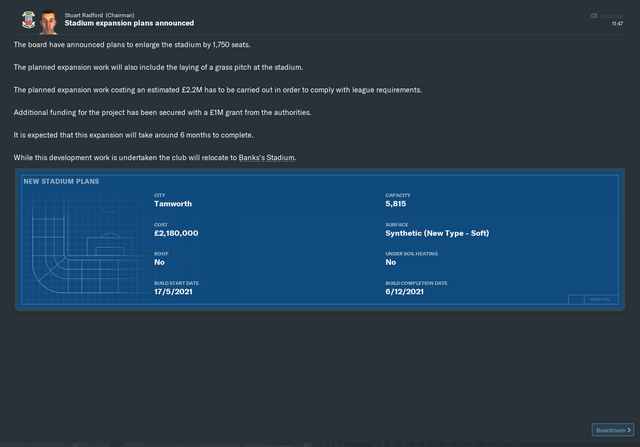 My choice of club settled on Farnborough, due to the simple fact they had the bigger stadium of the newly promoted sides, and they had a youth setup that wasn't completely obsolete. I also decided to take on a different approach for now; I am leaving everything other than tactics and coaching to my staff. That means that all staff contracts, staff signings, player signings and players contract negotiations are left to the board. 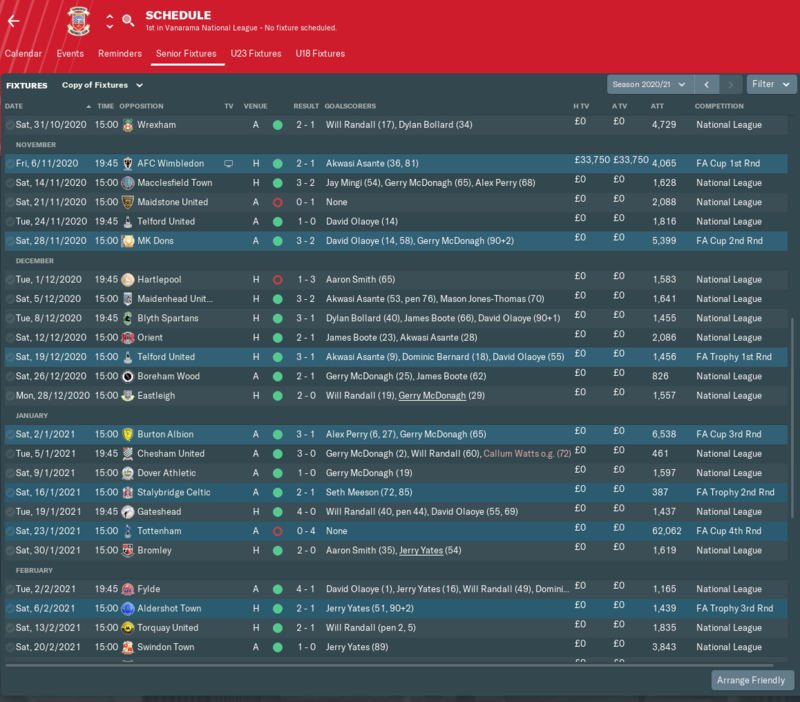 I did setup an affiliate program with Lincoln, but then I basically just managed the tactical and training side for the 1st season. All in all a very good season, that resulted in us being promoted with one game to go. Is attribute masking a must as part of the challenge? It was a case of fifth time lucky as Nantwich who were beaten in the playoff final last season finally sealed promotion to the National League. it's yet to be seen how the club will deal with promotion as we are currently up to our eyes in debt and barely treading water. Stadium expansion costs are quite expensive , just to meet league requirements and will take along time to pay for itself due to the fact we only get around 450 at a game. Rather late to the party but decided to give this a proper go for the first time in years! 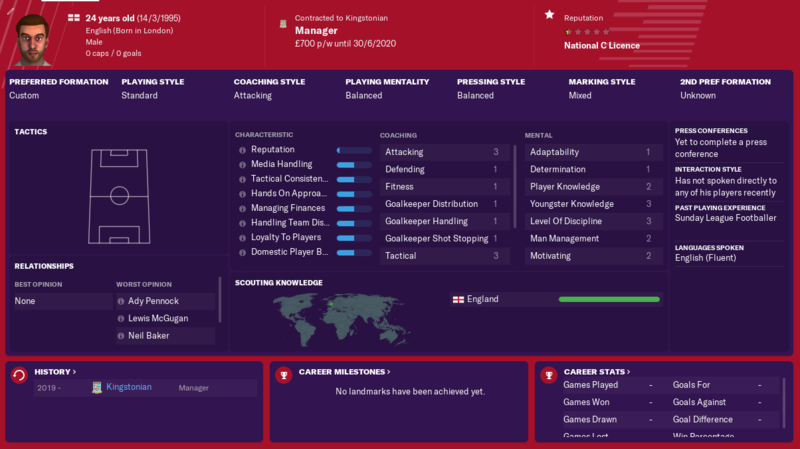 Was hoping to get lucky and get a load with Brightlingsea as one of the potential clubs to manage as they are the closest to me geographically, but got seriously bored with what must have been 100 or so reloads! 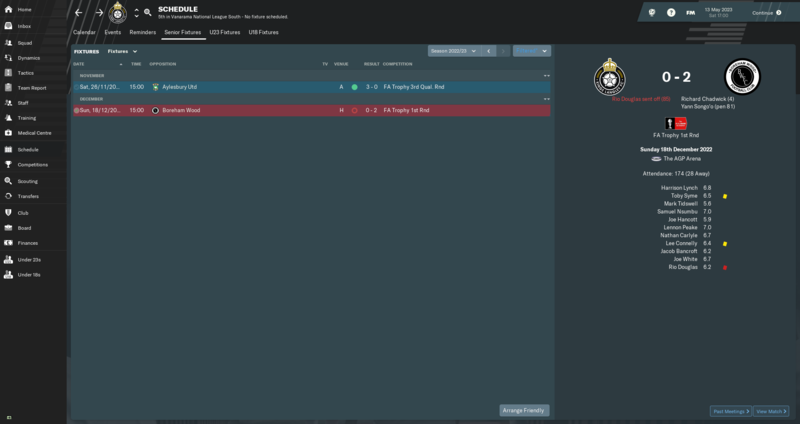 Decided to settle for a club I didn't think anyone else had started a save with. Every season we have been up there with the leaders but haves fallen away when it really matters. Could we make it back into the playoffs this season? League Table - it was the same old story as we challenged the leaders but then struggled when the fixtures piled up. Playoff 1st round - we took the lead and hung on for the win. 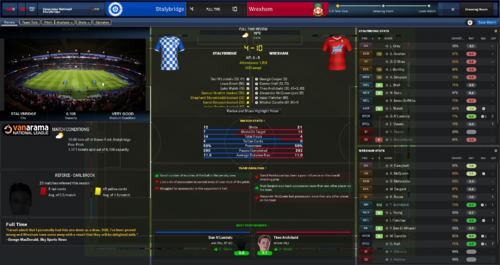 Playoff semi final - the scoreline flattered us as we made the most of our chances. Playoff final - we left it late, but we got the job done. FA Trophy - we lost out to the league winners. FA Cup - once again we came up short against the team from the higher league. 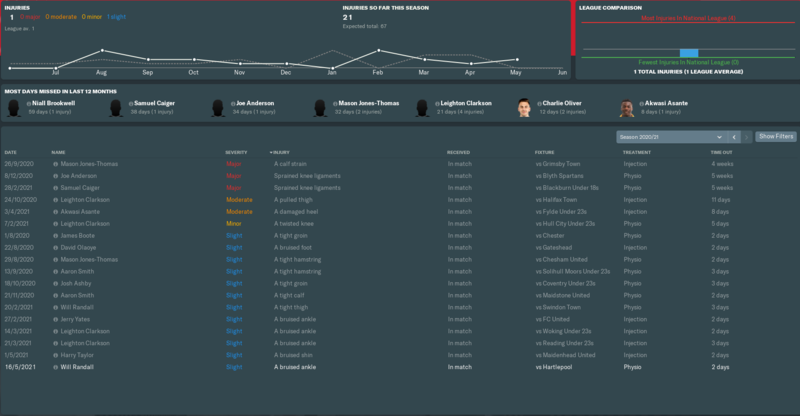 Squad - I'm not sure this squad is good enough for promotion, so I might need some new signings. Transfers - these signings were huge. Finances - we made a big loss, hopefully we get a big cup game next season. Troy Chiabi - the new signing was our top scorer. 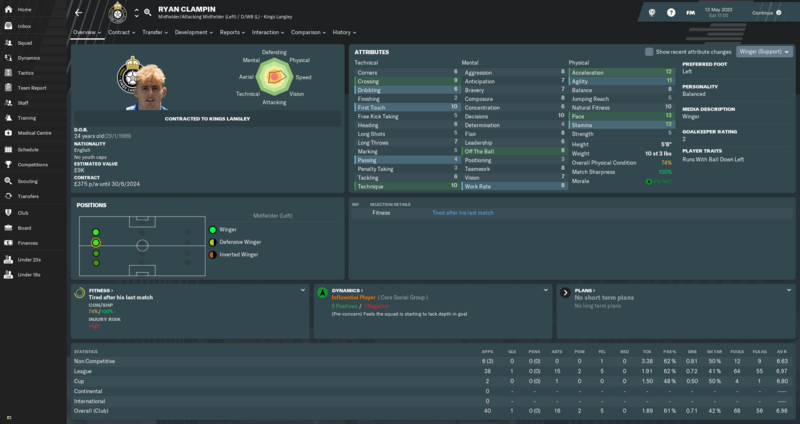 Ryan Clampin - I need good wingers like this. 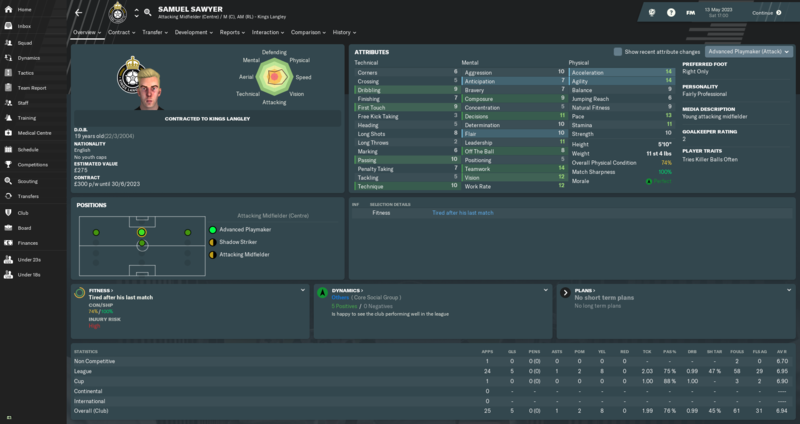 Samuel Sawyer - he was a great signing, but he might leave soon. Jordan Gabriel - the new right back. Joseph Olowu - this new signing was made our new captain. I'm really not sure if we are ready for promotion, so next season is a huge unknown. 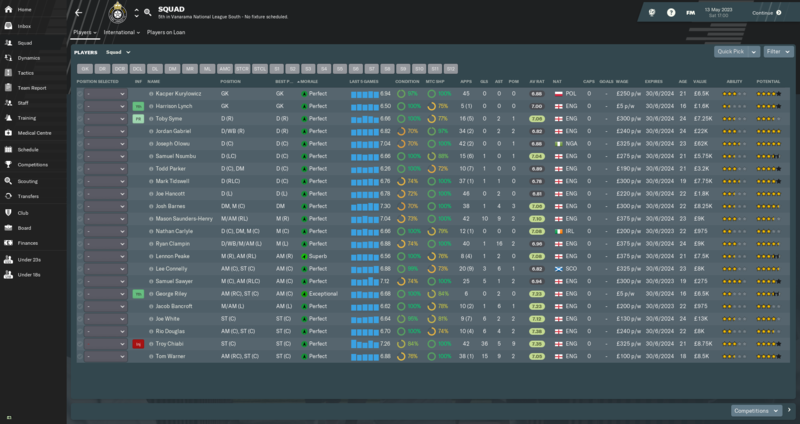 After a credible pre-season performance including wins against championship teams Norwich and Millwall I was pretty happy with the squad and was hopeful of having a good season, but the first two matches of the season washed away any such delusions! Playing against side predicted to finish 4th and 3rd respectively I expected to lose or maybe draw if lucky I did not expect the beating that I took. Thankfully, as I licked my wound and surfed Youtube I ended up on @Rashidi channel and I looked at the Pressing Lines Guide, a quick fresher and I set up my tactic for a mid-press to get a fantastic turnaround including a Cup win against an L1 team as well as League two predicted 1st team, Charlton! Not to mention my fans are happy as well because of the exciting football on display! In fact, it even helped me shut out Stoke in the League Cup!! We restricted them to 0 shots on target before winning on penalties! Had a strong start to the season scoring goals for fun. Got to 1st place and stayed there all year although never more than 5 points clear. My strikers drop in form over the last ten games meant that Salisbury closed up to 2 points going into the last game. A 2-1 loss away still proved enough to take the title as Salisbury also lost, it was just as well the league had no outstanding team this year. Worthing had the best attack and 2nd best defence. In the cups no real progress was made with the team losing 2-1 to VNL Ebbsfleet in the 1st rd of the FA cup. In the FA trophy the team lost to VNS Torquay. Finances stayed about the same with the board putting in 50 seats and agreeing to increase the youth level after promotion. I just can't believe what happened! How did we beat Chelsea at Stamford Bridge! Yes, they did put out a 2nd string team but it still had enough high-quality players to play us off the park! For the first time, I am actually speechless and did not have to lie in the press conference when I replied I am speechless! 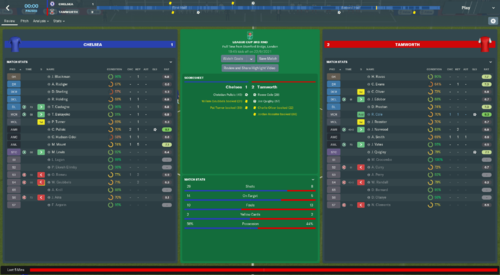 In case, anyone wants to see the match Chelsea 1-2 Tamworth.pkm this has to be the highlight of my career as of now on FM19. Awful squad. Awful board. Awful fans. Finally had enough and resigned. I can't remember a worse save I've ever had than this one. Seriously. 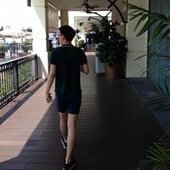 Will be back with another team soon. 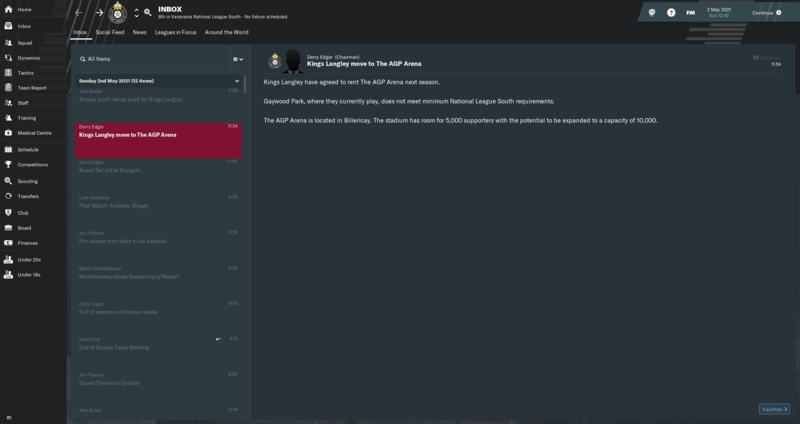 League – season preview prediction had me finishing 21st however after a pretty decent first season in the VNL last year finishing in 10th, I had my own personal target of challenging for a play off spot (even tho I made the silly statement in my previous update saying the aim is top 4). 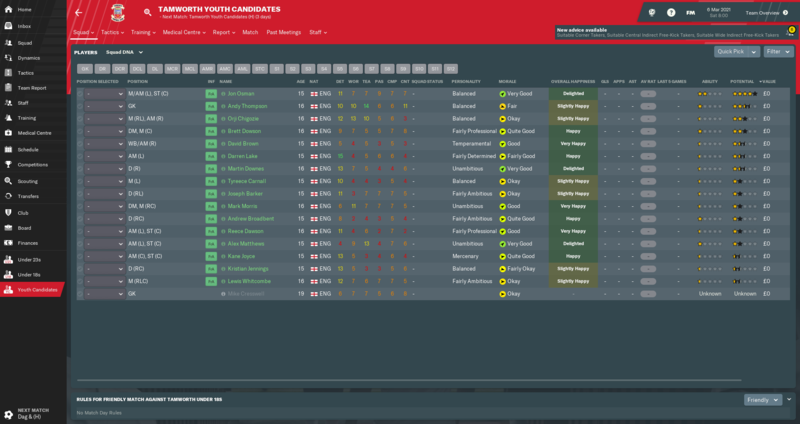 Had an ok offseason signing a couple new strikers and brought in some young CB’s addressing our most crucial needs. The season did not start off as I had hoped, we lost our opening game at home to Dover 4 – 0 in a televised match where we outshot our opponents and only allowed 1 CCC. I drew my next game and lost the next two before getting my first win of the season. We then lost the next 3 to find ourselves last. I tinkered with our tactics a little and we started go get better results. To be fair to the players, I don’t think we’re a team deserving of being near the relegation zone in the first place and it was pleasing to see that we achieved mid table again. Along the way we had some really good results, notching wins away against the top teams but then suffered this crunching defeat in the 3rd last game of the season. 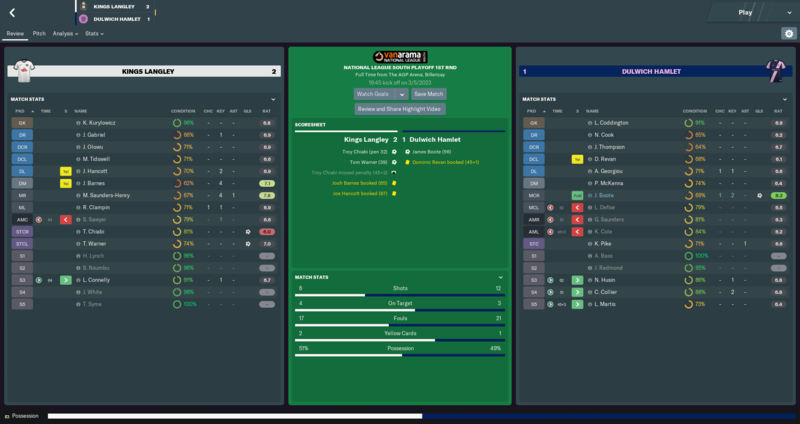 Have never conceded 10 goals in a league match in all my FM careers and needless to say we broke a number of unwanted Stalybridge and VNL records! Overall, it was our home record that was poor, losing 13 of the 23 home games. Strange old season where we had the second best goal difference away from home with +9 and third worst home at -12. Will need to sort this out for next season if we are to progress. 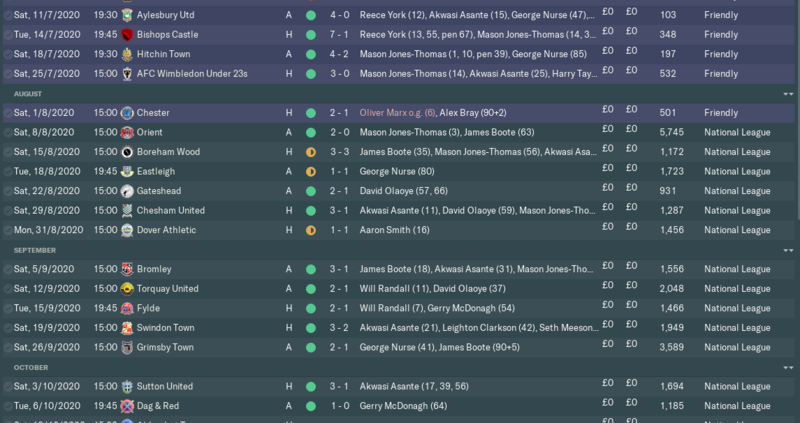 Again didn’t do well in the cups, was knocked out in the 1st round of the FA cup by Gateshead at home (we’re in the same league) and was knocked out of the FAT by Morecombe 4 – 1 away who are also in our league. Unfortunately no real income boost from either of these with our finances again in a dire situation. Next seasons the aim will be to improve and hopefully challenge for a play off spot. We now have some really decent strikers and a good CM pairing. Im thinking of a tactic change as even tho this formation (3–2-2–1–2WB) - worked in VNN, the fact that we’re playing 3 CB’s is starting to annoy me as im finding it the hardest position to rate well and its also hard to find good WB’s at this level. Is this challenge doable on Nintendo Switch/Touch version﻿﻿?